Applying for a job is never an easy task. Adding up to the burden is writing the resume. A resume contains all the important information that an employer needs to know about an applicant. It is where you can showcase all your achievements, qualifications, qualities, and talents. There are also a lot of resume formats available online. 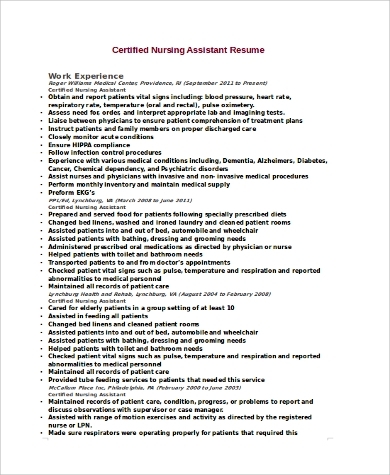 Here we will focus on resumes for Certified Nurse Assistants. 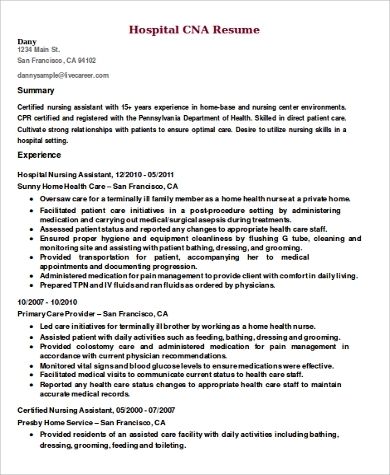 Our Sample Resumes below are sure to help you get that job in the hospital you have been dreaming of. The samples we offer are detailed and thoroughly thought out. We made sure that any employer reading it would want to hire you. Below are the types of resume formats that are used in our samples. 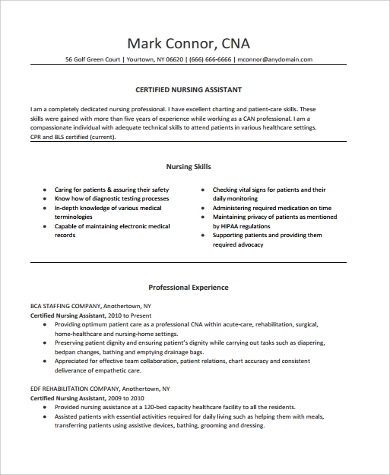 These formats are also used in our Sample Nursing Resumes and Sample Registered Nurse Resumes. 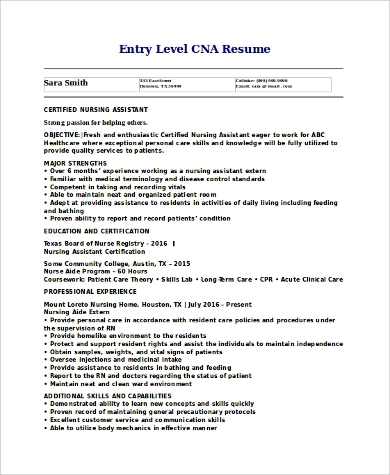 Chronological – This is the type of resume that is preferred by most employers because it lists an applicant’s employment history in chronological order. 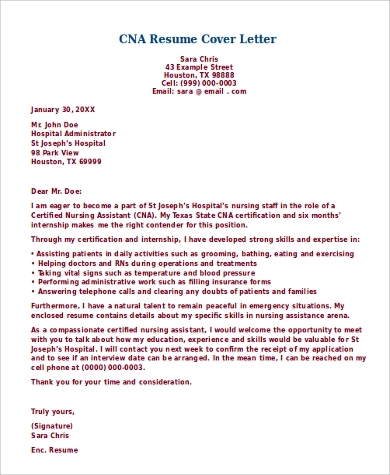 It is also the most commonly used format in creating resumes. People with solid work history use this type of format. Functional – The employment history is a secondary priority in this type of resume. Its focus is on your skills and experience. This is the most effective type of resume if you have a diverse background but without a clear career path. Combination – It allows you to write in detail both your skills and experiences together with your employment history. 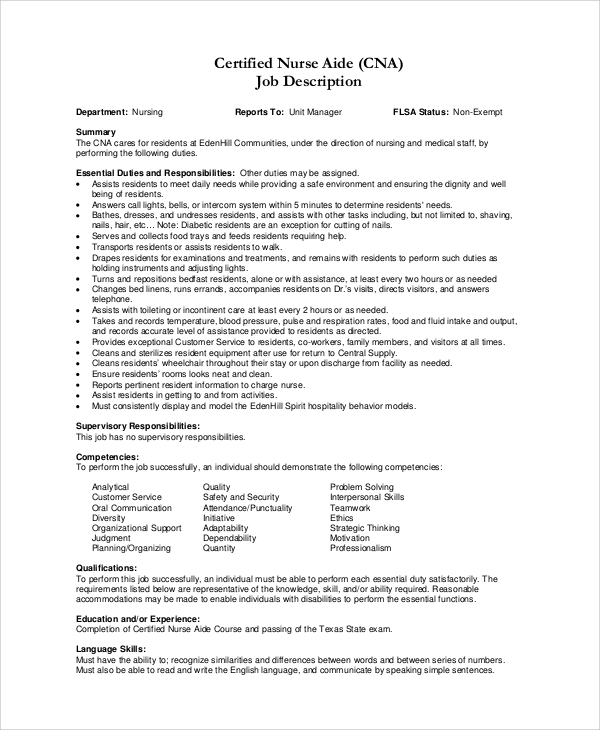 This type of resume is used to show the hiring company the type of employer you are. Targeted Resume – The details in this type of resume is customized to fit the job description or the position that is hiring. It is most time-consuming, but your efforts are worth it since it can generate good results. 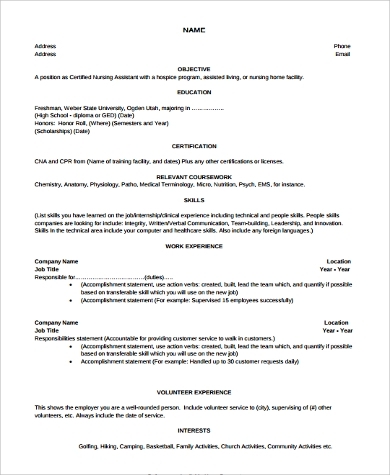 Resume with Profile – Contains a brief summary about the applicant and helps them sell themselves to the company they are applying. Mini Resume – It highlights your career qualifications and contains information specific to the job you are applying for. Why Is a Good Resume Important? Writing a resume is like advertising yourself, or selling yourself to a certain company you wish to be a part of. Instead of selling products or services, you will be showcasing your skills, talents and good qualities to the employer. A good resume will give anybody a good impression about you and good impressions last. If your resume is good enough, then you will be hired for sure. Put your name and contact information on top. If you want to put an objective, make sure that it is not a generic objective. Keep it short and simple. The hiring manager wouldn’t have time to look at the second page of your resume. Make it look readable. Use a font that is easy to read and add bullets if necessary. Always spell check and proofread your resume. A resume will always be a very important tool used by those who are applying for work and for those seeking for promotion. The competition among certified nursing assistants is tough. Giving a good first impression through your resume gives you a lot of advantages. 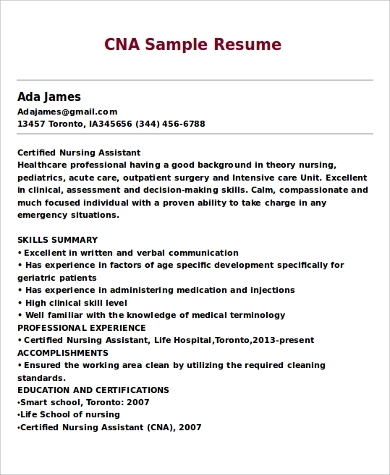 With the availability of the best CNA sample resumes, you wouldn’t have a reason to get left behind. 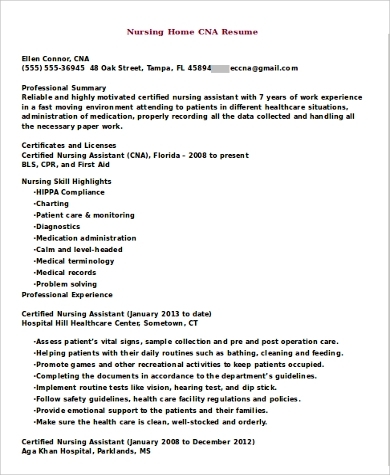 We also have Sample Nurse Resumes available for online download.